Quest for the grail: Lincoln Center Out of Doors version of A Crimson Grail for 200 electric guitars to be released on Nonesuch | Will You Miss Me When I'm Gone? The wheels started turning, and quickly at first. 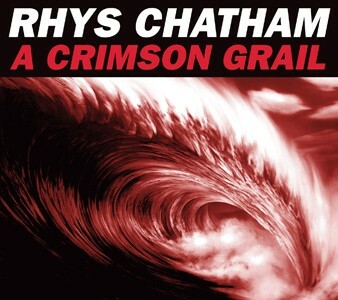 In January, we made contact with Rhys and his producer Regina Greene, who informed us of the considerable personnel and logistical requirements for a performance of A Crimson Grail. First among them was “200-400 guitarists” and 16 bassists, each of whom would need to be a professional-quality player (“no amateurs!”) who could read music and commit to three days of rehearsal in addition to the day of the show, and would also have to lug their own guitar and amplifier to the rehearsals and soundcheck—which, due to the budget and the number of people involved, would all be on an unpaid volunteer basis. We would have to find a secure indoor location with enough space (not to mention electricity) for the guitarists to rehearse on the three days in sections of 50, 100, and 200, and also a way to arrange all of the musicians and amps safely at an outdoor space where several thousand people would be in attendance. The guitarists were to be conducted in four sections of approximately 50—themselves subdivided into soprano, alto, tenor, and bass parts–with each seat location specially placed for its sonic and spatial properties, and with Rhys leading the four section conductors from the stage. We might also note, Regina added, that A Crimson Grail should be performed close to sunset, as the piece was written to be performed in the evening. A call went out, a Web site went up, and many hundreds of guitarists applied. They came from other cities, states, and continents, from ages ten and twelve to sixty-plus, in singles and in groups—husbands and wives, fathers and sons—all people who were eager to fly to New York and devote the better part of a week in August to learning this beautifully strange and meditative work of music. We decided on the basement and sanctuary of the extraordinary Church of St. Paul the Apostle near Columbus Circle for the rehearsals, and thoroughly tested the ingenuity of Lincoln Center’s production staff in setting up a power distribution system, hundreds of chairs and music stands, and many miles of cable to power the amplifiers lining the long aisles of the sanctuary. For three days, I sat in on the rehearsals and watched how the guitarists who had been strangers to one another on the first day gradually became friends and bandmates. A Crimson Grail was turning out to be not only a concert performance, but also, truly, a coming-together of musical community. On the morning of August 15, 2008, the day of the show, I woke up and checked the weather report online, which promised a semi-encouraging 30% chance of rain in Manhattan for the day. All of us had been anxiously keeping an eye on the skies since the first day of rehearsal, which had greeted us with ominous gray clouds and a heavy six o’clock shower that continued dropping rain intermittently outside the church during the rest of the week. All along, we knew that at a certain point, a decision would have to be made about moving the performance indoors, to the church—where at most 800 people would be able to see it—or to roll the dice and keep the event outdoors. As Rhys, Regina, and Bill and I discussed, once a decision was made, the amps, generators, and cable would either have to be trucked over to Damrosch Park over several hours, or stay in place. At the church that afternoon, where all of us had been scheduled to meet before moving everything over to the band shell, it was announced that the weather appeared to be improving, and that we were going to go for it outdoors. Not a few of the guitarists pumped their fists and cheered when they heard the news, and I was obviously among them. An unlikely procession of 216 guitarists and amplifiers marched up Columbus Avenue. At 2 p.m., the soundcheck began, and, as if on cue, the sky brightened, and the sun came out. For several hours, Rhys, the section leaders, and the sound engineer worked out volume levels and dynamics, all in perfect weather, while a crowd of curious onlookers slowly assembled at the perimeter of the park, magnetically pulled in by the spectacle and the sound. After the soundcheck was over, at 5 p.m., the guitarists had 90 minutes for a dinner break before they had to check in back at their positions. At 5:30, the house opened, and several thousand people began streaming through the gates of Damrosch Park. It was then that, with little warning and consummate disregard for our plans—and with only an hour until the start of the show—the skies opened up and let loose a tornado-strength rainstorm that was equal in its ferocity and heartbreaking apathy to the brilliant sunshine we were having just a few hours earlier. The production team rushed to collect loose sheet music, cover amplifiers with plastic tarps, and gather the loose cords, pedals, and power strips that had been left in place. Still, I held out hope. The first of the three acts that evening—a classical vocal ensemble named Beata Viscera, which was singing the polyphonic music of the French medieval composer Pérotin—performed their set from under a portable tent onstage while rain fell around them, to a patient and supportive crowd of steadily drenched umbrellas and ponchos. With the rain diminishing but not letting up, Bill made the smart and on-the-fly decision to move the last act on the bill—the German guitarist-composer Manuel Göttsching, and the U.S. live debut of his 1984 techno composition E2-E4—up from third on the program to second, where he too performed from below cover, with Joshua White’s famed Joshua Light Show saturating the curve of the bandshell with psychedelic abstract swirls. Finally, after ninety minutes of downpours—about halfway through Manuel’s set, and monumentally to my relief—the rain petered out. Lincoln Cent er’s technical staff conducted a careful examination of the venue, only to find that the entire park site in which we were standing—amps, guitar cables, electricity and all—was submerged below an inch or two of water. With the crowd waiting in nervous anticipation, some very difficult conversations between Rhys, Regina, Bill, the section leaders, the production crew, and myself happened. 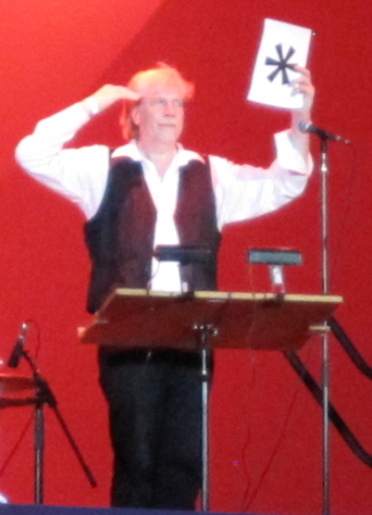 Eventually, Bill got up on stage to make what must have been one of the most painful public announcements of his entire career—that there was simply no way he could ask the guitarists to plug in and run the highly probable risk of electrocuting themselves and the many thousands of people who were still at the bandshell. The concert was over. Or rather—as I thought to myself on the way home—it never even happened. And so, we did it all over again. We set another date, found another rehearsal space at the Fashion Institute of Technology—alas, the Rockettes had already booked the church!—sent out another call for guitarists, and tried to learn from our mistakes. Rhys rewrote parts of the score, added a percussionist to synchronize the timing across the huge ensemble, and clarified instructions and cues that he thought could be improved upon from the first go-around; he also brought along his daughter to play guitar, all the way from Paris. At the second round of rehearsals, I remember thinking it strange that no one among the guitarists or crew seemed to be saying a word about the weather—as though it were absolutely a foregone conclusion that this time, it was going to happen, no matter what. Of the 216 guitarists and bassists who volunteered for round two of A Crimson Grail, a remarkable 120 were “alumni” musicians who had also taken part “the last time” (as we called it) and wanted another chance to get it right—which I think we finally did. On the night of August 8, 2009, Lincoln Center’s technical staff created an elaborate weather-proof setup comprising hundreds of feet of riser platforms and white tents to protect the musicians from whatever the gods might have in mind for them. Rhys’ conducting podium was built standing six feet above the stage so he could be seen by the section leaders and musicians over the tent-tops. The excitement and anticipation that had building for more than a year was amplified as the Asphalt Orchestra, an experimental marching band developed by Bang on a Can, paraded into the venue playing an arrangement of a song by the Swedish avant-metal band Meshuggah. A Crimson Grail began, first with a raga-like drone stilling the crowd and focusing their attention, followed by the antiphonal call and response of guitar tremolo circling the audience members, who sat surrounded by 216 amplifiers. At the grand finale of the piece, when the guitars start to near the summit of that final glorious crescendo—about 65 minutes into this live recording—a crowd estimated at nearly 10,000 people at Damrosch Park spontaneously stood up from their chairs in unison and cheered, as if they were at a revival meeting. As someone remarked to me after, it was more than slightly suggestive of King George II rising to his feet at the triumphant “Hallelujah” chorus of Handel’s Messiah. For my part, that moment was worth the time and heartache it took to get there. With Rhys Chatham’s composition Guitar Trio (1977) he became the first composer to make use of multiple electric guitars in special tunings to merge the extended-time music of the ’60s and ’70s with serious hard rock. Chatham continued this pursuit over the next decade, culminating in 1989 with the composition and performance of his first symphony for an orchestra of one hundred electric guitars, An Angel Moves Too Fast to See. This entry was posted in Concerts, Contemporary Classical, Music, News, Recordings and tagged A Crimson Grail, Bill Bragin, Lincoln Center Out of Doors, Rhys Chatham, Ronen Givony, Wordless Music. Bookmark the permalink.